Even though I have a birthday party to enjoy this weekend, I'm already looking forward to the next celebration. Easter Sunday dinner is one of my favourite occasions. 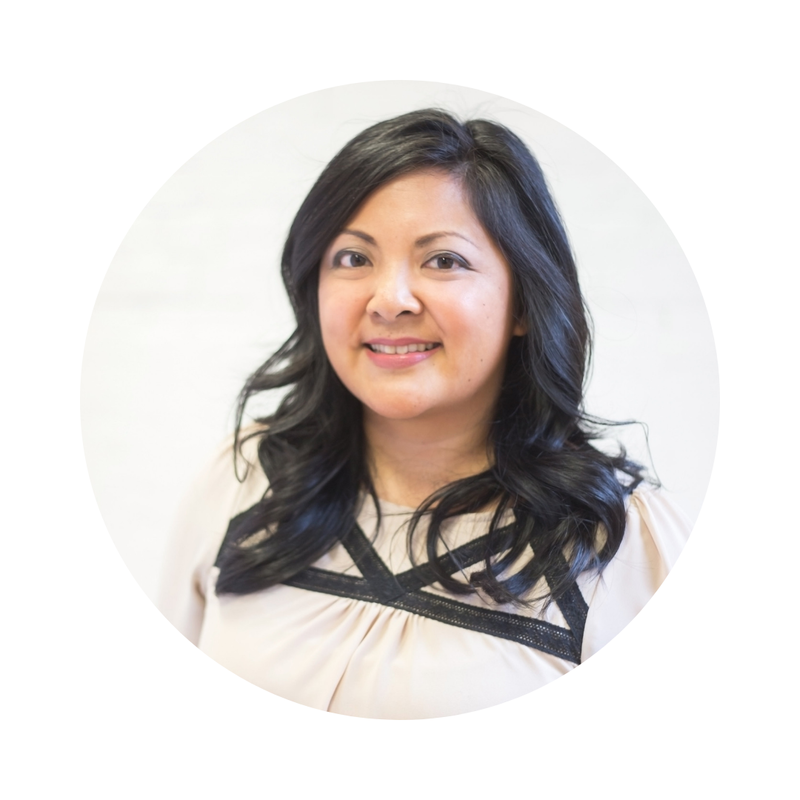 You have the joy of dining with family or friends but without the pressures the holidays usually bring. Maybe it's because Easter happens in the springtime, with its fresh colours, sunshine, and the laid-back vibe that implies. But laid-back doesn't mean any less special. 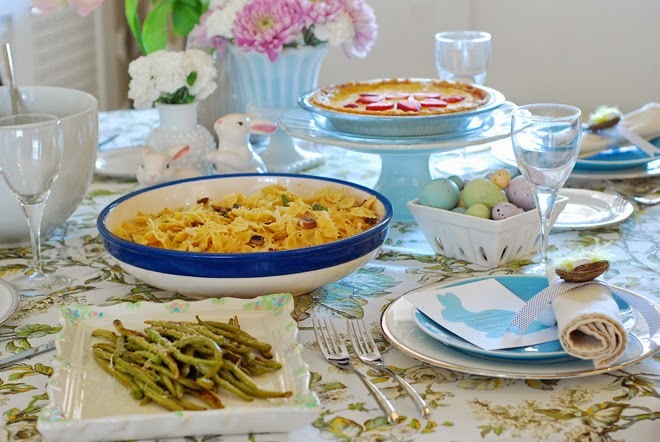 In case you're up for a stress-free celebration, I wanted to share some ideas for throwing an Easter celebration that is easy, welcoming, and delicious. 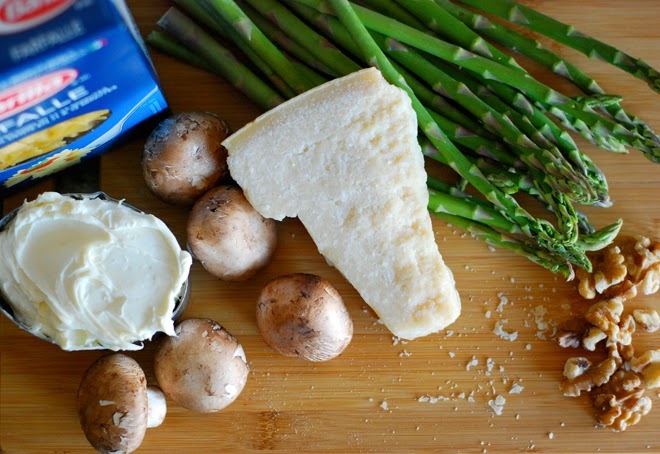 Every good meal starts with the freshest of ingredients. In the springtime, vegetables such as asparagus, artichokes, green beans, spinach, and lettuce are all in season. My daughter can be a picky eater, so I like to cook a meal I know she's going to eat but also introduce one or two ingredients that she hasn't tried before, just to expand her palate. One thing Chloe never refuses is pasta, so pasta it is! 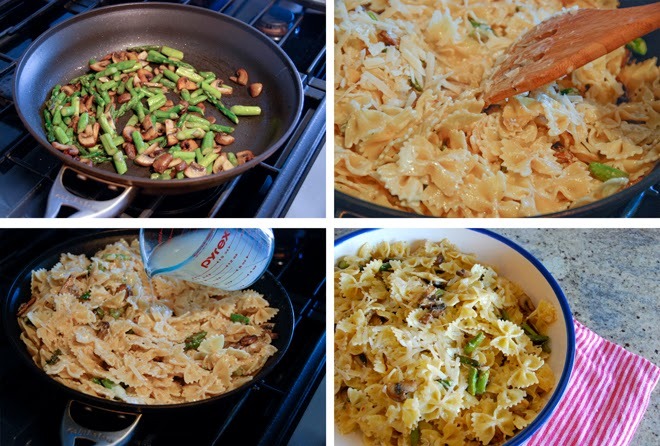 I decided to make this recipe from Giada De Laurentiis/Food Network for Creamy Farfalle with Cremini Mushrooms and Asparagus (with a few adaptations I learned from Chef Lorenzo!). It's a very simple and quick pasta to make. Bring a large pot of salted water to a boil. 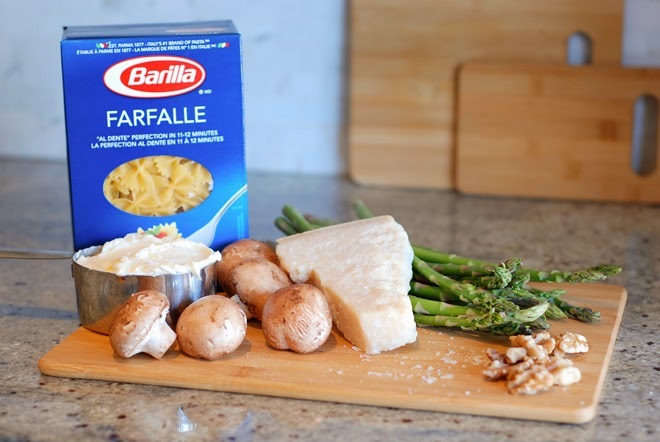 Add the farfalle and cook according to the directions on the box. Drain the pasta, reserving 1 cup of the cooking water. Meanwhile, drizzle the olive in a heavy large skillet over medium heat. Smash one clove of garlic with the side of a knife. Rub the garlic on the skillet. Add the butter. Add the mushrooms and saute until tender, about 5 minutes. Add the asparagus and saute until the asparagus is crisp-tender, about 5 minutes. Remove the garlic clove. Add the farfalle. Stir in the mascarpone and nutmeg and toss until the pasta is evenly coated. Add the reserved cooking water to moisten. Season the pasta to taste with salt and pepper. Transfer the pasta to a large bowl. 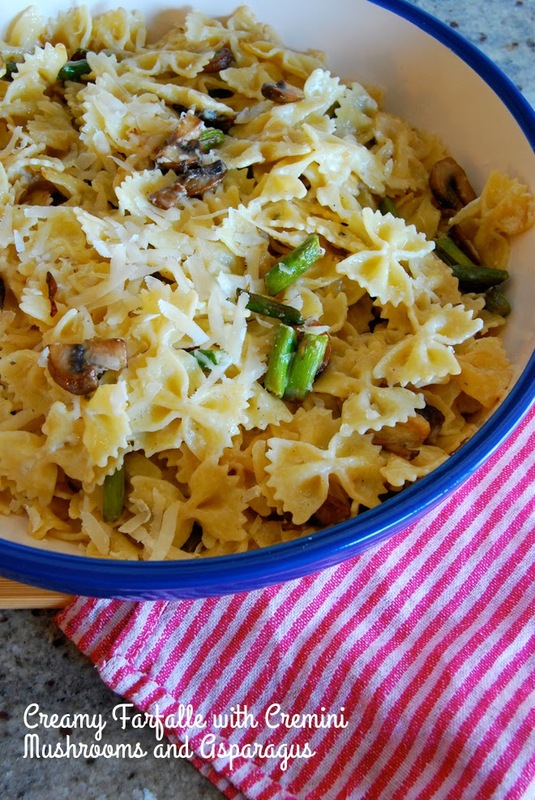 Sprinkle with parmesan and walnuts. Serve. Let me tell you, that pasta was delicious. 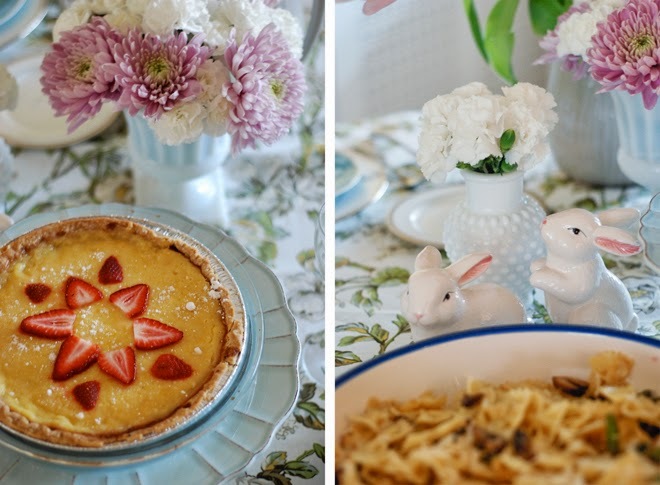 I made a few other simple spring-inspired dishes to complete the menu - spinach & strawberry salad, salmon cakes, roasted parmesan green beans, and lemon tart (always a family favourite). 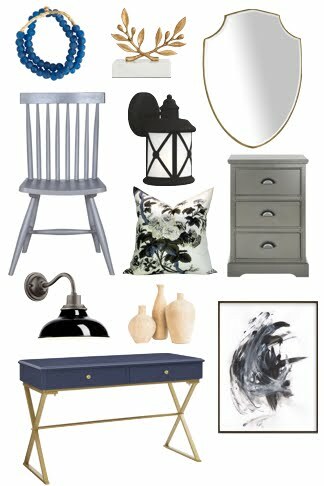 I really had fun putting together the decor too. 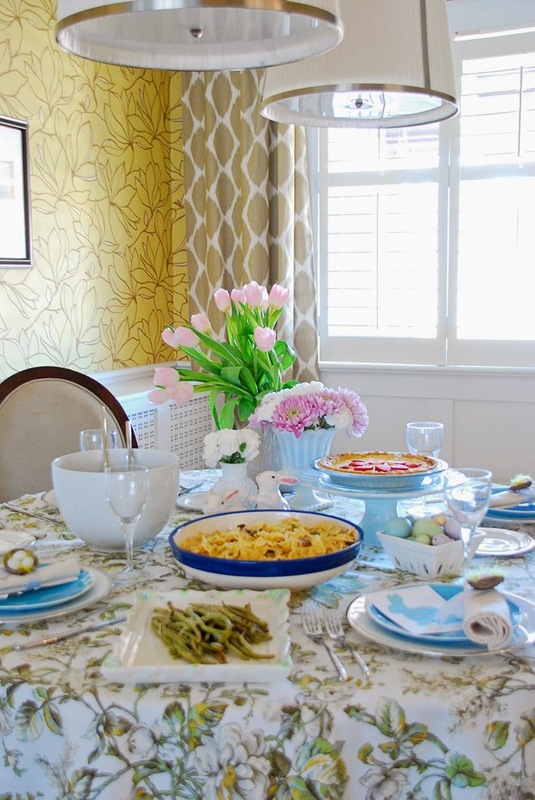 I find that Easter decorations can be a bit on the frilly, sugary side but I wanted to set a dinner table that was more soft and sophisticated. The floral tablecloth really sets the tone and using a bold pattern means you can be a bit more muted with your other table accessories. Thrifted milk glass vases and cute bunnies found at the dollar store are inexpensive touches. Two other must haves: a cake stand (it adds height to the table and can make dishes stand out), and fresh flowers. The place settings were pretty cute. You've already seen the nest egg napkin ring. 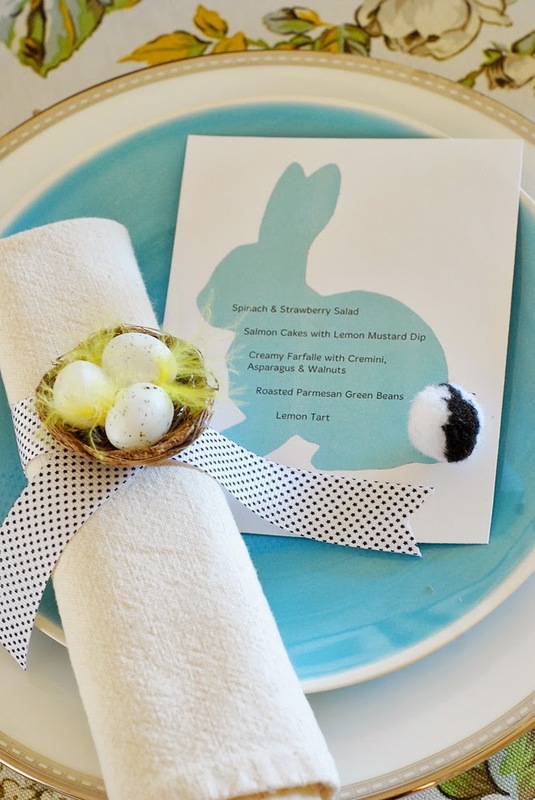 For the menu card, I found a bunny silhouette online, added text on top of the image, and hot-glued on a pom-pom tail. So easy and I think menu cards always make a meal feel extra special. The blue salad plates are a new purchase and I've placed them atop our formal dishes. We received these dishes as wedding gifts and we don't use them nearly enough. I'm so glad I had the chance to dust them off and use them for this meal. Good music is the last element you need to round out this celebration. I'd have this Songza playlist, Acoustic Versions of Pop Songs, playing in the background. Its soft enough not to drown out the conversation and laughter around the table, and up tempo enough to keep everyone in a casual, friendly mood. 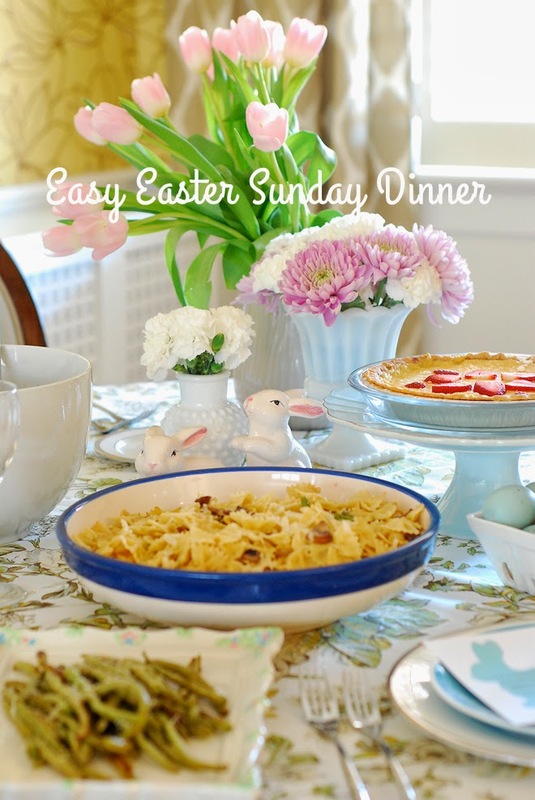 Perfect for a laid-back Easter Sunday dinner.